PCB connectors - rated IP69. 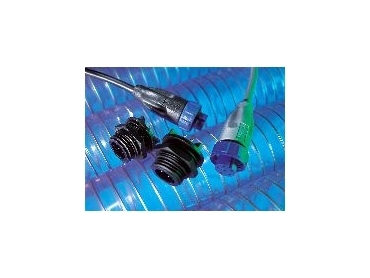 AVAILABLE from Braemac , Bulgin's smallest waterproof connector, the 400 Series Buccaneer, has now been joined by a PCB mounting panel version. Available in 4, 6, 8, 10 and 12 way the PCB connectors have gold plated contacts rated to 5A 125V ac/dc (4-8 way) and 1A 50V ac/dc (10 and 12 way) and are fully compatible with the 400 Series flex connectors. PC spill length is 3.5mm, designed for use in 1.6mm PCBs. Both pin and socket contact versions are available allowing safe power entry and exit from equipment.